Hangfire is one of the easiest ways to perform background processing in.NET and.NET Core Applications. In this application we are going to learn how we are can integrate Hangfire with ASP.NET Core application. Hangfire allows you to create background task in.NET applications. It’s extremely easy to integrate. It allows you to kick off method calls outside of the request processing pipeline in very easy but reliable way. You can store those jobs in on premise SQL Server, SQL Azure, Redis, MSMQ or Redis. You can find more information Hangfire on the following link. Hangfire also contains one of very maintained documentation at the following link. To demonstrate how we can integrate with ASP.NET core, I’m going to create a new ASP.NET Core application in Visual Studio 2017 like below. Once click on it will ask for the selection of Application task we are going to select Web Application like below. As our application is not ready, We are going to install Hangfire nuget package in the application. Now we are done with adding Hangfire to our asp.net core application. We need to create a SQL Server database for Hangfire application. Here I’m going to use SQL Server for Job storage but there are various Job Storage options available as mentioned above. Now we need to have ConnectionString for the database. Let’s put it on appsetting.json like below. "HangFireConnectionString": "Data Source=SQLServer;Initial Catalog=HangFireSample;User ID=YourUserName;Password=YourPassword;MultipleActiveResultSets=true"
Now in Startup.cs file configure services method we need to integrate hangfire like below. Here I’ve added hangfire to our application and also indicated that we are going to use SQL Server for Job storage and provided connection string for the same. Now Hangfire integration is easy to use. When you run it will automatically create tables related to Hangfire configuration and storage as below. Now you can easily add background task like below at any place. Even you can add recurring job which will run at a specific time like below. That’s it. You can see it’s very easy to use and You can integrate Hangfire very easily. Hope you like it. Stay tuned for more!. There are lots of new features added with ASP.NET MVC 6 and View components is one of them. In this blog post we are going to learn about View Component in ASP.NET MVC 6 in detail. So the first question comes in our mind is why we need a View Component as all? As partial views are there and its serving its purpose very well. But if you have worked with partial views you know that there is a limitation for partial views you can not have controller associated with it. You have to use Child actions with partial views and as you now when you mark any actions with child actions it will only allow for child you can not use that as a complete action. Also it will make a extra server trip which could make your application slow if you have a very complex view. That where View Component can help. It's contains a view and backing class It's not a 100% controller but it acts like a controller. Let's create a View component that can be reused at multiple places. Think about a ECommerce application where you have multiple product categories which can be displayed multiple places in ECommerce application. We are going to create a view component that will list multiple categories. So to create a View component we need a ASP.NET 5 ASP.NET MVC 6 application. So have created web application from Visual Studio 2015. Then created a model class category for storing categories information. Then created a View component with following code. I have created a invoke method which will return data for the view. In our case we have created manual list as we don't need database for this example. But you can write any code for the same. See view component attribute on the top of class. We need to use same name when call this view component. Now it's time to create a view for the view component. I have created this component under /Views/Home/Components/ProductCategoriesComponent/default.html as we have given same name in attribute. As this view component is used home/index.cshml I have putted there but if you have generic view than you can put that in share component also. Following is a code for the same. A simple ul-li listing. Now it's time to use this view component in one of view. I have putted following code in Views/Home/Index.cshtml. So you can see how our hard code categories renders under view. Even you can passed argument with view component invocation that we will see in future blog post. In most of the line of business application we need some kind of reports. Now days we need those reports as PDF format as it is the most convenient way of storing documents. I have written a post about creating a PDF in ASP.NET MVC with Razor PDF and it is one of the top visited page on my blog. But now I have found a better way to create a PDF with ASP.NET MVC so I thought it will be a good idea to write a blog post about it. So in this blog post we are going to learn about creating PDF with ASP.NET MVC with the use of Rotativa as open source framework for creating PDF with ASP.NET MVC. It is a framework created by Giorgio Bozio with the purpose of creating PDF in ASP.NET MVC extremely easy way. It is based on wkhtmltopdf tool to create PDF from html content rendered on browser. It uses the web kit engine which is used by Safari and Chrome browser to render html. And support most of HTML tags and styles. It is a open source command line tools so Giogio has created a nuget package to use this tool as PDF creator. You can find more information about Rotativa from the following links. So to create example, I have created a ASP.NET MVC application. The first thing we need to do is to add Rotativa Nuget Package in our application. Here is the model class I have used to demonstrate power or Rotativa. In this example, we are not going to use any database so we are going to hardcode data in customer. so We have done is hardcode list of customer in controller and returning it to a view. And in view we has displayed this list as table like following. If you see in above code, I have used a image to display profile pic. I have also used different styles for td element in table to display power of Rotativa. Even I have used hardcoded style directly. At bottom I have created Html Action link to print this view as PDF and following is a code the printing this view as PDF in Action Result. And when we run this application it looks like following. Now when you click on Print it will create a PDF like following. This was pretty basic demo but there are lots of options also available with Rotativa you can find that options in documentation on Github as well. I have shared same link above. I have been learning SimpleInjector for few days and it’s just awesome. I have already written two post about it(see below link) and this post will be third post about it. In this post we are going to learn how we can do Dependency Injection with ASP.NET MVC. For those who are reading my posts about Simple Injector Following are two previous post I have written about Simple Injector. I highly recommend to read first two post so that you can be aware about how we can configure SimpleInjector container. So let’s start with creating a ASP.NET MVC Project from Visual Studio. Before some time I have blogged about Attribute Routing features of ASP.NET MVC 5.x version. In this blog we are going to learn how we can create stackoverflow.com like URLs with attribute routing. If you compare and understand structure of this URLs. You will know that there will be a two things which will be dynamic for this URLS. ASP.NET MVC contains great features and Bundling is one of them. The Bundling and Minification features allow you to reduce number of HTTP requests that a web page needs to make by combining individual scripts and style sheet files. It can also reduce a overall size of bundle by minifying the content of application. From ASP.NET MVC 4 bundling also includes CDN support also where you can utilize public CDN available for common libraries. Let’s look this features in details. Libraries like jQuery, jQuery UI and some other libraries are commonly used in most of the applications. There are available in CDN (Content Delivery Networks) specifying the URL of particular library with specific version. Bundling now has CDN path as parameter in default bundle functionality where you can specify the path of the CDN library and use that. So when you application run in production environment first it will check whether CDN are available or not if available then it will load it from the CDN itself and If CDN is not available then it will load files hosted on our server. CRUD Operation with ASP.NET MVC and Fluent Nhibernate. Before some time I have written a post about Getting Started with Nhibernate and ASP.NET MVC –CRUD operations. It’s one of the most popular post blog post on my blog. I get lots of questions via email and other medium why you are not writing a post about Fluent Nhibernate and ASP.NET MVC. So I thought it will be a good idea to write a blog post about it. Convection over configuration that is mantra of Fluent Hibernate If you have see the my blog post about Nhibernate then you might have found that we need to create xml mapping to map table. Fluent Nhibernate uses POCO mapping instead of XML mapping and I firmly believe in Convection over configuration that is why I like Fluent Nhibernate a lot. But it’s a matter of Personal Test and there is no strong argument why you should use Fluent Nhibernate instead of Nhibernate. Fluent Nhibernate is team Comprises of James Gregory, Paul Batum, Andrew Stewart and Hudson Akridge. There are lots of committers and it’s a open source project. You can find all more information about at following site. On this site you can find definition of Fluent Nhibernate like below. Fluent, XML-less, compile safe, automated, convention-based mappings for NHibernate. Get your fluent on. They have excellent getting started guide on following url. You can easily walk through it and learned it. So all set it’s time to write a sample application. So from visual studio 2013 go to file – New Project and add a new web application project with ASP.NET MVC. ASP.NET MVC is a new buzz word in Microsoft.NET stack most of people have started learning into it. So recently before some time Microsoft has released a Major new version of ASP.NET MVC with ASP.NET MVC 5.x. There are lots of new features given with ASP.NET MVC 5.x versions and I’m going to write a few series of blog post to explain all the features in details. So stay tuned with that!! In this blog post I’m going to explain attribute routing in ASP.NET MVC 5. From the first version of ASP.NET MVC It’s provides a routing out of box. You don’t need to do much about it. Routing is how ASP.NET MVC matches URL in browsers to action. Based on URL a particular action is called on particular controller and result will be provided as view. Recently before some time I have created a blog post about list of blog post I have written about Petapoco Micro ORM. So one of the friend suggested I should write same kind of series post about Dapper Micro ORM so that reader of my blog can find the all the posts on same page. So that’s why I writing this blog post. Dapper is Micro ORM developed by Sam Saffron few years ago while he was working as lead developer at stack exchange. This ORM was developed specially for Stack Exchange QA sites like stackoverflow.com and superuser.com for the performance improvement. It has got a single file where all the code has been written. You can download dapper Micro ORM from the following location. Following is a list of post related to dapper Micro ORM that I have written on this blog. If I write blog post about dapper then I will keep adding into this list. That’s it. In this post we are going to learn how we can use NHibernate in ASP.NET MVC application. ORMs(Object Relational Mapper) are quite popular this days. ORM is a mechanism to map database entities to Class entity objects without writing a code for fetching data and write some SQL queries. It automatically generates SQL Query for us and fetch data behalf on us. NHibernate is also a kind of Object Relational Mapper which is a port of popular Java ORM Hibernate. It provides a framework for mapping an domain model classes to a traditional relational databases. Its give us freedom of writing repetitive ADO.NET code as this will be act as our database layer. Let’s get started with NHibernate. There are two ways you can download this ORM. From nuget package and from the source forge site. I am going to use SQL Server 2012 express edition as a database. Following is a table with four fields Id, First Name, Last name, Designation. Let’s create a ASP.NET MVC project for NHibernate via click on File-> New Project –> ASP.NET MVC 4 web application. I have installed nuget package from Package Manager console via following Command. It will install like following. Nhibernate needs one configuration file for setting database connection and other details. You need to create a file with ‘hibernate.cfg.xml’ in model Nhibernate folder of your application with following details. Here you have got different settings for NHibernate. You need to selected driver class, connection provider as per your database. If you are using other databases like Orcle or MySQL you will have different configuration. ThisNHibernate ORM can work with any databases. Now it’s time to create model class for our CRUD operations. Following is a code for that. Property name is identical to database table columns. Now we need a xml mapping file between class and model with name “Employee.hbm.xml” like following in Nhibernate folder. I have created a class in models folder called NHIbernateSession and a static function it to open a session for NHibertnate. Now we have our open session method ready its time to write controller code to fetch data from the database. Following is a code for that. Here you can see I have get a session via OpenSession method and then I have queried database for fetching employee database. Let’s create a new for this you can create this via right lick on view on above method.We are going to create a strongly typed view for this. Our listing screen is ready once you run project it will fetch data as following. Now its time to write add employee code. Following is a code I have written for that. Here I have used session.save method to save new employee. First method is for returning a blank view and another method with HttpPost attribute will save the data into the database. Now let’s create a create view strongly typed view via right clicking on view and add view. Once you run this application and click on create new it will load following screen. Now let’s create a edit functionality with NHibernate and ASP.NET MVC. For that I have written two action result method once for loading edit view and another for save data. Following is a code for that. Here in first action result I have fetched existing employee via get method of NHibernate session and in second I have fetched and changed the current employee with update details. You can create view for this via right click –>add view like below. I have created a strongly typed view for edit. Once you run code it will look like following. Now it’s time to create a detail view where user can see the employee detail. I have written following logic for details view. You can add view like following via right click on actionresult view. now once you run this in browser it will look like following. Now its time to write delete functionality code. Following code I have written for that. Here in the above first action result will have the delete confirmation view and another will perform actual delete operation with session delete method. When you run into the browser it will look like following. In this post we are going to see how we can do CRUD operations with ASP.NET MVC and PetaPoco Micro ORM. Petapoco is a tiny ORM developed by topten software. As per them it’s a tiny, fast, single-file micro-ORM for .NET and Mono. As per topten software it contains following features. Microsoft has released the much awaited ASP.NET MVC 4.0 developer preview and there are lots of features bundle with it. One of the greatest features is a mobile website. Yes, Now with ASP.NET MVC 4.0 you can create mobile site also. So let’s create a simple application and let’s see how it works. To create mobile site first you need to click File->New Project->ASP.NET MVC 4.0 Web application. Like following. Now once you click OK it will open a new another dialog like following where we have to choose the Mobile site. As you can see in above post I have selected Razor view Once you click it will create a new application like following. As you can see similar structure as normal MVC Application application below. This view are based on the standard jQuery Mobile. So this can be viewed in any tablet or mobile device. So if you have IPad and IPhone both then it will work on both. You need not to different application for both. see the browser first I have selected standard IPad size of browser. Now lets see how it look in mobile. So I have made my browser same site as mobile. As you can see its working in both. If you see the code of view you can see the razor syntax over there. Nothing change in razor syntax. But as you can see in below code you need to use Jquery mobile attributes like data-Role and other stuff which will convert standard HTML into mobile or device compatible website. That's it. It’s very easy you can create mobile compatible site in few hours. Hope you like it. Stay tuned for more.. Till then happy programming. After so much buzz Microsoft has launched some of the new tools at build conference and ASP.NET MVC 4.0 Developer preview is one of them. How I can install ASP.NET MVC 4.0 Developer preview? 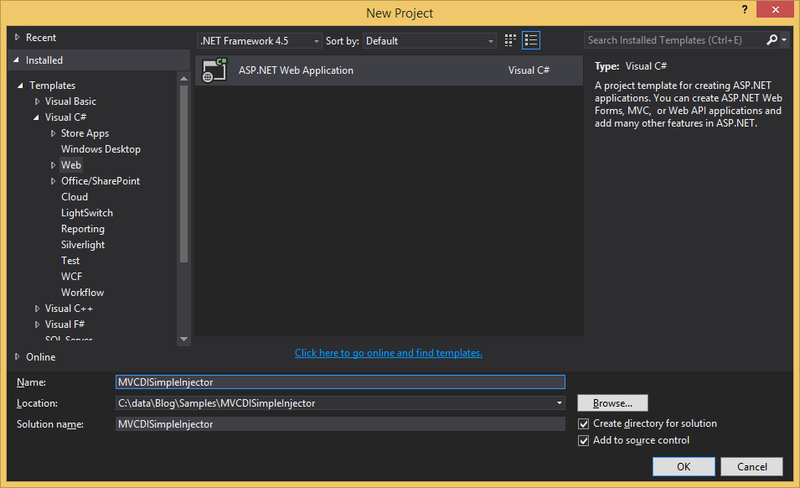 You can also install ASP.NET MVC 4.0 Developer Preview from following link-http://www.nuget.org/List/Packages/AspNetMvc. If you don’t know about what is NuGet Package. Please visit following link of my blog. There are lots of people thinking that for asp.net mvc 4.0 developer preview, you need to install Visual Studio11 Developer Preview. But that is not true.It works with both. You can also run ASP.NET MVC 4.0 developer preview with side by side with ASP.NET MVC 3.0. You can use any of above method to install asp.net mvc 4.0 developer preview on either of Visual Studio Version. You can create new asp.net mvc project as same old method like File->New Project and ASP.NET MVC 4 Web Application. Once you click OK It will open a dialog where it will open a dialog like following. As you can see now there one more option for mobile application too. So this is one best thing in asp.net mvc 4.0. Now you can create mobile base application also. I will going to post about that in future posts. Now I want to create Internet application I have selected and Clicked ‘OK’ and created new application. This will create basic mvc application. Now lets run application via F5 and it will look like following in browser. As you can see in above image in browser Microsoft has given new template for asp.net mvc 4.0. Also there is new contact page in application. I will also going to post about this in future post. That’s it. This was just a introduction post to ASP.NET MVC 4.0 Developer preview. There are lots of features are available in ASP.NET 4.0. I am going to explorer all this features in future posts. Hope you like it…Stay tuned for more.. Till then Happy programming. In the previous post I have already explained How we can list data from database easily with the help of EFCodeFirst . In this post I am going to explain How we can complete Create,Edit,Delete and Details operations within 10 minutes. So let’s first Start with Create a new Customer.I am going use same example of customer from previous post. So we have customer controller there so Let’s first create a new view for Create via Selecting View in Create() method of Customer Controller and Clicking on Add View and dialog box will open for add view like following. As you can see in the above template I have selected Customer Model Class for strongly typed view and Selected Scaffold template as Create once you click Add your view will be ready. Now its time to write for code in customer controller to Add Customer. So I have modified Create Method of customer controller which we have created like following. That's it. We have done with Create Customer now. In the above databasecontext add method will add customer and SaveChanges method will save changed to database. Now once we are done with Add its time to create edit and update functionality. Let’s first Add a view via Selecting view with Edit Method in clicking on Add view. Once you click a dialogbox for add View will open for that like following. As you can see you I have selected scaffold template as Edit and I have Created Strongly typed view with Customer class. Once you click add it will create a new view for Edit. Now our Edit View is ready so let’s write code for Edit/Update in database. So first we have to modify Edit(int Id) method like following which will return specific customer with View. Following is a code for that. Now let write code to update the changes to database. So for that I have modified another ActionResult Edit of customer controller like following. That's it we are done with the edit stuff.In above code the state modified will tell databasecontext that customer details is modified and savechanges will save changed to database. Now its time to create view for delete functionality. So I have clicked on Add View and Created a view for delete like following. Here I have create Strongly typed view with Delete Scaffold Template. Now let’s modified both Delete Action Result in Customer Controller class. First Action result will return customer which we are going to delete and another delete action result with id will delete the customer from database and then it will return to main customer page. I have modified the code for both as following. Here I have done something different then editing stuff to demonstrate the feature of Entity framework. You can also use Id for finding the current customer and then change its state to delete and SaveChanges will save that to in database. So now we are done with delete also. It’s now time to create details part. So same as above I have create a view with scaffold template details with customer model like following. Once we are done with creating view . It’s time to change the code for Details Action Result like following to return current customer detail. So that's it. We are done with all the stuff. So with Entity Framework code first. You can create basic CRUD application within 30 minutes without writing so much code. Hope you liked it. Stay tuned for more.. Till that Happy programming.